AICA conference, Soweto. Service being addressed by the new AICA President, President E V M Maqina. AICA. Scenes from s the conference. The President of WAAIC presents a gift to an executive member. AICA conference. Service held at a nearby Methodist church. AICA. Scenes from a Sunday church service at the conference. Those attending included members of several churches, and representatives of foreign donors. AICA. Scenes from a Sunday church service at the conference. 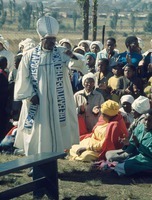 Archbishop M P Radebe of the Bantu Bethlehem Christian Apostolic Church of SA (1) preaching at an outdoor service. AICA. Three AICA Presidents - left to right: Bishop S Manana, President E V M Maqina, Moderator J Mthembu. - see Martin West, Bishop s & Prophets in a Black City, chapter 8. St Francis Church (57). Bishop and Mrs Nakeli collecting sea-water for healing, in Cape Town during an AICA conference.